Captain Emil Jan Kornacki who was born June 8, 1920 in Baranów Sandomierski, Poland peacefully passed away at the age of 97 on May 4, 2018 at the American Veterans Hospital in Saginaw, Michigan. A family bedside service was held followed by the playing of Taps and an American Honor Guard which escorted his body from the hospital. He was the recipient of the Virtuti Militari for extraordinary bravery at the Battle of Monte Cassino in 1944. Subsequently he was the recipient of the Krzyż Walecznych for his courageous actions at Monte Fortino. 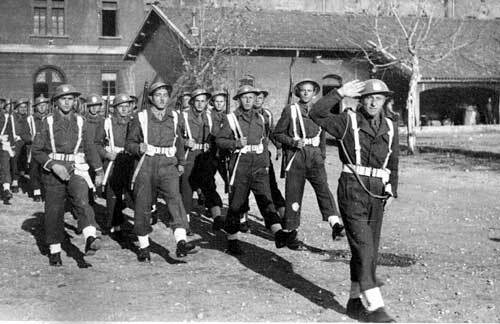 He also was the recipient British and Italian military awards for his service during the Polish Second Corps Italian campaign. In an extraordinary event, Captain Kornacki had been invited to fly with President Lech Kaczyński, his wife Maria, and other distinguished Polish civilian and military dignitaries on April 10, 2010 to attend a memorial service at Katyń. Illness prevented him from going to Poland and taking that fateful and tragic trip to Smoleńsk. Captain Kornacki was the husband of the late Zofia Marcińkowska (1921–1995). As a consequence of her being a member of the Polish Resistance when she was captured by the Nazis, she was incarcerated and tortured at Pawiak Prison in Nazi-occupied Warsaw. Subsequently she was sent to the infamous concentration camp at Ravensbruck in Nazi Germany. She was there for four long years. The Kornacki’s had two daughters, Monika and Elizabeth and two grandchildren, Elise and Ian. Captain Kornacki was fluent in Polish, English, Italian and Russian. After his release from the Ander’s Second Corps he resettled in London, England where he met his future wife Zofia Marcińkowska. Trained as an engineer he and his wife subsequently moved to the United States. They became American citizens and lived in Detroit, Michigan where they raised their family. Captain Kornacki was very active in the Polish community, including being a member of Polish Veteran’s groups. He had a great passion for music and sang in several choral groups throughout his life. A voracious reader and deep thinker, he had a great love of Polish history which he studied consummately, particularly on writings about Katyń and the Battle of Monte Cassino. In addition to his professional career, Captain Kornacki’s life in America was distinguished by his being an interpreter for many Poles who did not speak English well if at all. He did this work pro-bono- refusing to accept any payment. He believed it was his duty to help those Poles less fortunate than himself. He also had another great mission in his life and that was to speak about the Katyń Massacre, not only to Polish but also to English-only speaking groups. 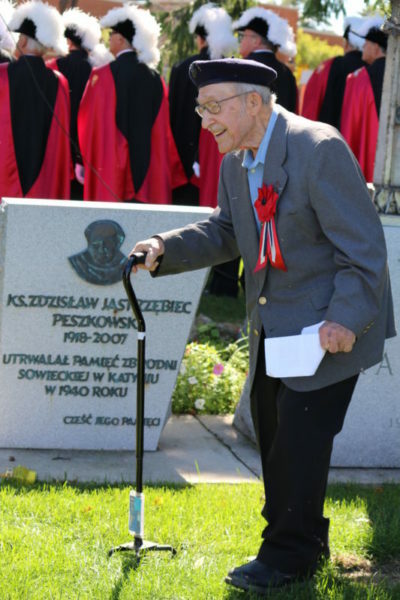 He was especially fond of speaking to young children, high school and college students about Katyń and Polish history in general. He had a remarkable, grandfatherly ability to connect with these students who were absolutely enthralled by Captain Kornacki, his life story and its lessons. Among his most distinguished speaking engagements was his moving words at the 1991 dedication of the now very well-known monument -in America and Poland- to the murdered soldiers of Katyń in Jersey City New Jersey. The monument is the remarkable creation of the renowned Polish sculptor Andrzej Pytyński. At the dedication ceremony Captain Kornacki left his most precious possession of his service to Poland, his Virtuti Militari medal. When asked why he has spent so much of his life in speaking about Katyń and why he risked his life at Monte Cassino in what was a nearly impossible effort under murderous German fire to save the lives of his fellow comrades-in-arms, he responded in what was his philosophy of life. Because it was my duty to my comrades-in-arms and to Poland!